Unlocking the legislation criminalising cannabis in South Africa can completely transform the economy, according to The Dagga Party of South Africa also known as Iqela Lentsango. The Daily Vox chats to party leader Jeremy Acton about where it stands on the future of South Africa. Founded in 2009,Â this will be the first time the party will compete in the national election which is set to take place in May. 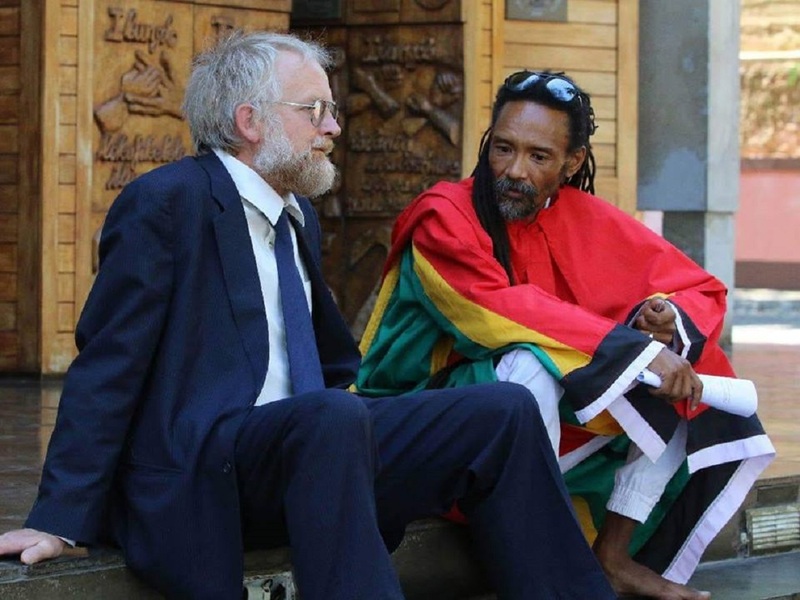 With a national supporters base that extends to a number of demographics, Acton counts the Rastafarians, the Zulus, Muslims, the Asian community among the partyâ€™s supporters. But anyone can be a supporter of the party. â€œAnyone is a potential supporter who believes in the plant and who uses this plant,â€ Acton says. The party is going full throttle to raise the funds for the pricey registration fee and complete the paperwork to compete in the 2019 national election. It will also have an online membership system up and running by the end of the month. The Dagga Party has got a two-pronged approach to politics. The first is to build ward groups: networks of people who support the Dagga Party or just the use of cannabis itself and are non-political. The second is have access to the seat of power where legislation about cannabis will be happening. Acton says the Dagga Party wants to be among the legislators who will write the legislation about the regulation of cannabis. Last year, the Constitutional Court ruled that criminalising private use of the plant was unconstitutional. This was a victory for users of the plant but the Dagga Party wants to take this further. Acton says the party wants to transform the economy with cannabis. The plant has multiple uses: it can provide nutrition through hemp seeds and fiber for manufacturing, for example. Regulating cannabis provides the economy with a whole new resource to benefit from. We are the only political party that stands for a whole new resource in the economy. â€œThe first thing about the future of cannabis is that we want to make sure that itâ€™s allowed for complete equity in participation by real people,â€ he says. In other words, Acton says he doesnâ€™t want the use of the plant to be restricted with â€œlicensing, corporations, and cronies amongst the state and corporationsâ€. Itâ€™s to unlock the resource equitably for the people. Acton says the party wants to unlock the resource for use in the manufacturing, housing, tourism, and the medical sector. Unlocking the resource means that more people can participate in the economy which deals directly with unemployment. Cannabis is also vital for the environment and to foster a cleaner energy supply, Acton says. â€œWeâ€™ve got to get off fossil carbon and get onto cannabis carbon which is climate change friendly as itâ€™s carbon neutral,â€ he says. (Editorâ€™s note: cannabis farming can be carbon-neutral when cultivated in a specific way.) Besides, the Dagga Party has a strong commitment to green policies. Since the 90s Acton was involved with the Green Party of South Africa and since then has been a part of a number of environmental movements in Cape Town. He decided to leave the party because although the Green Party did have a cannabis policy, starting something like the Dagga Party would allow him to â€œpromote green policies but to place an emphasis on cannabis as the resource that we need,â€ he says. â€œIâ€™ve had a longstanding interest in sustainable livelihoods and ecology and how the two may subsist together. Cannabis is the key species that allows us to relate better to the planet,â€ Acton says. The party wants to emphasise three renewable energy pathways: solar thermal, biogas methane from sewage works, and medium-scale wind power where itâ€™s relevant. â€œPutting the three of those together in every settlement, we would like to create an energy autonomy in each municipality,â€ Acton says. This would mean that instead of relying on Eskom to burn coal, Eskom could just be the distribution system with people becoming the generators, he says. â€œEnergy issues are the crucial issues for the welfare of our economy,â€ Acton says. Besides the environment, there are concerns about a partyâ€™s stance on women, on the youth and where it stands on the land question. As more than 50% of the population, Acton says women should have rights too. â€œWomen carry a heavy burden in terms of raising children so we canâ€™t have less rights for women in terms of payment and the workplace, for example,â€ he says. The Dagga Party, Acton says, is proposing â€œa programme for young female school-goers so they are encouraged to stay in school and consider matric as a bottomlineâ€. For example, any young woman who makes it to matric without falling pregnant should be given a bonus by the state like a bursary, he says. â€œOur children can only develop as far as their mothers develop, speaking generally. Some kids fly to higher levels than their parents achieved. One should delay having children until the mother is developed in terms of opportunities, world awareness, skills, and access to land,â€ Acton says. For the Dagga Party, land is a major issue. The Dagga Party supports land redistribution, and itâ€™s position on land is very much influenced by the cultivation of cannabis. This is because, as Acton says, the legalisation of cannabis will allow everyone to become productive of a resource. â€œWe can redistribute land on the viability of cannabis farms and it makes it much more possible,â€ he says. For the Dagga Party, every person should have access to land. â€œThe need for small farms for families [is] a priority,â€ says Acton. This will mean that no matter what vocation people choose, they will always have value growing at home in the form of cannabis. Cannabis is a valuable resource to grow, Acton says. â€œItâ€™s not that youâ€™re going to smoke it all, you might chop up the sticks and build a new roof for your house for example or you could sell the sticks and get some money for it,â€ he explains. â€œYou canâ€™t create an economy when people have got no space to do work and to be productive. Itâ€™s not about finding employment, itâ€™s about being productive,â€ Acton says. In a country with such stark numbers for youth unemployment, Acton is asking the youth to consider what cannabis can do for their futures. â€œ[The youth] must please consider cannabis relative to what it can provide as their possible solution to have a sustainable future,â€ Acton says. â€œThey must consider the futureâ€. â€œI must warn the youth that the future is dire,â€ he says. The upcoming elections will make a marked difference is the direction the country will take in the next 50 years, Acton says. The first step for the youth is to register to vote. Then they can start looking at what political parties offer in terms of their visions for the future, he says. Acton is also urging young voters to consider issues-based voting and not just tradition-based voting. This would meaning voting on issues rather than sentiment. Acton says what sets the Dagga Party apart is that it offers the South African political landscape an entirely new idea: cannabis as the resource on the ground to create a grassroots-based economy. Literally.